Today's post comes from a reader (actually, I've had several ask me this same question over the last week or two... 'tis the season! ): "I'm starting to think about sending out Christmas cards and I want to make printed labels. How is the best way to do that?" Gone are the days of hand-writing mailing labels! Making labels on a Mac is super easy, and it requires no additional software. Here's how. In order to make our labels, we're going to use the built-in Contacts app. If you're already using Contacts to manage your addresses, phone numbers, email address, etc, then you are 80% of the way there. If you're not, you have a little preparatory work to get done. For those who are not already using Contacts, we need to get our address information into Contacts. If you're looking for the easiest (not necessarily the quickest) way to do this, get your fingers ready to do some manual data entry. This is especially true if you have your addresses hand-written on a piece of paper somewhere. If you happen to have them stored in an Excel file or some other electronic list, you're in luck! All you need to do is export that list into a CSV (Comma Separated Values) format, then use that CSV file to import into Contacts. Easy peasy! Ok, so you have your contacts saved in your Contacts app. That means you're ready to print your labels! Well, almost. First, you want to make sure that you have your contacts organized into a group. For example, you would create a group called "Christmas Cards" for, well, sending Christmas cards. Simply create the group, then drag and drop entries that belong in that group. 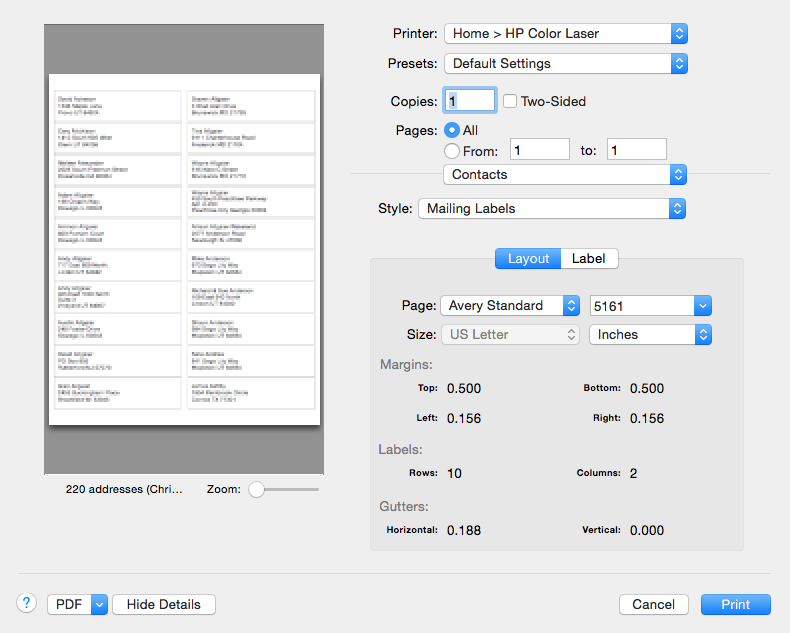 From here, we choose the options we want to use to design our labels (label size, fonts, colors, etc) and print! You want to pay particular attention to the page and label type. My recommendation: use Avery-brand labels. Not only are they great quality, but each packet has a special 4-digit code on the outside. All you need to do is use that code as your label style (for example, I am using code "5161" in the above example), and the rest of the formatting happens automatically! One last recommendation: don't forget to click on the "Label" tab. This is where you can format your labels (and there are some pretty cool options in there). Posted on November 21, 2014 by Kevin Allgaier and filed under Design, How To, Mac.